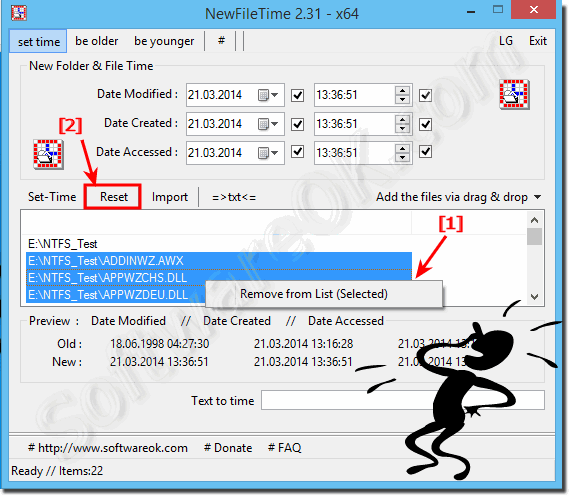 The solution is simple to remove files and folders from the file time list in the freeware NewFileTime ! If you want to remove individual files in NewFileTime. Select the files or folder where the file time should not be changed and click with the right mouse button on the selected objects in the file list. Now just confirm the remove of the files! Info: Of course, in both cases the files will be not deleted from the hard disk, but removed from the file list in NewFileTime. (Image-1) Remove files and folders from the file time list! NewFileTime - FAQ-3: How can I remove files and folders from the file time list? I wanted to synchronize file times make two or more folders with files, in the program I had then found that the folders and all files contained in them are wrong How can I select multiple files and folders to remove them from the file time list? In MS File Explorer, I sorted files and folders by date, size, name, and other parameters. Dan, I have the files for these specific parameters by drag and drop added, unfortunately, were also a par wrong case, there is the possibility to exclude them in the file time change, please help! ?